BabyGrins.ca is having a pre-Father's Day early bird special! 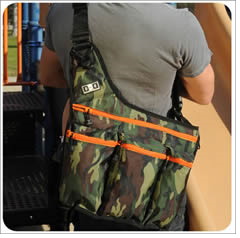 Get 15% off Daddy Diaper Bags or Goober Baby for Gent travel-size diapers and wipes holder. These cool baby accessories are designed with Dad in mind! BabyGrins.ca carries a lot of unique products for babies, so be sure to check out the rest of the store! Shipping starts at $7.95 for orders up to $19.99. Free shipping for orders $150 or more! The sale ends June 1, 2009. Click here to check it out! 0 Response to "15% Off Daddy Diaper Bags and Goober Baby for Gent at BabyGrins.ca"